Before I get going into my general delight of this book, decide for yourself if being historically accurate is important to you. There are some readers who are yanked right out of a historical romance if the idioms or customs are not time-period appropriate and it ruins everything for them. There are others who either choose to ignore such writing choices or are blissfully unaware of historical accuracies. The camp you fall into is important for this book, as The Legendary Lord has an absolute boatload of inaccuracies in it. Other reviewers have pointed these out more ably than I, but the foods they eat are wrong, the premise itself feels dubious, the idioms used in conversation weren’t invented yet, and some of the ways the hero, Christian, thinks about fashion and customs don’t exactly ring true. So again, if those things are going to get jammed in your craw, as it were, then turn away now. As for me, personally, I selectively care about such things. If a book is going to be flagrantly inaccurate, it better have book magic and weave the characters themselves so brilliantly that I stop noticing. It better make me root for the hero and heroine quickly, better have some great side characters, and better be consistent it both its delightfulness and its inaccuracies. If you’re going to essentially create a fictional world, then create a good one, is what I’m saying. So, for me, this book was delightful. That book magic was present and even though I rolled my eyes or raised an eyebrow a few times, I found myself not really caring. I adored the characters, I chucked out loud at some of the conversations, and was utterly charmed by the emerging romance. The premise is thus: Lady Sarah Highgate is betrothed to an utterly boring and pompous human. After suffering a panic attack at the thought of marrying him, she runs off to what she thinks is her father’s hunting cabin in Scotland. Instead, she gets lost and ends up in the hunting cabin of Christian Forrester, better known as Viscount Berkeley. There’s a few plot machinations, including a snowstorm, that mean they get stranded alone in the cabin for a few days with no chaperones and just each other. They clearly fall for each other, but Lady Sarah must marry higher than a Viscount and Christian is in need of a wife to bear an heir. They strike a deal. Christian, through his scheming friends whom readers have met in previous books, works something out to protect her reputation and ensure the marriage to the pompous doof can move forward. In return, Sarah will help Christian become a “legend” in a season. You see, he’s been to London for several seasons, but is utterly forgettable. He’s determined to give it one last go, but needs a bit of a translator to the ways of the ton. Who better than one of the previous incomparables? Of course, Sarah’s tips work and Christian ends up in high demand in London. Of course, Sarah suffers more panic attacks at the thought of being trapped. And of course, they are the only two people who truly know each other. So, of course, they end up in their happily ever after and I sighed contentedly when it happened. Along the way, I found myself wanting more stories from this gang of friends and was excited to find out that there are, in fact, five previous books! 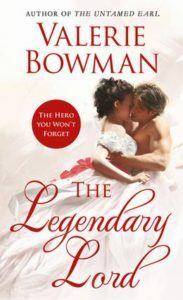 The Legendary Lord is the 6th book in Bowman’s “Playful Brides” series and I’m hoping they’re all as delightful as this one. As I said before, I know this book isn’t for everyone. There may even be times in my reading life that I wouldn’t have enjoyed it as much, who knows. I read this after a long few days of professional conferencing and this was the emotional equivalent of a warm bubble bath. I got to rest into this story and enjoy myself along the way. I read it with a delightful glass of gin and tonic on the flight home. The idea of an incomparable – the female version of Christian’s legend – is credited to Georgette Heyer. Read more here! This review originally appeared at Romance.io. England, Gin and Tonic, Historical, Regency, Romance, Scotland, U.K.